How to report an incident in the park. Membership of the Friends group cost £5 per household per year. Members are the first to hear of events happening in the park, receiving invitations to join in guided walks, litter picking, working parties etc. by email. 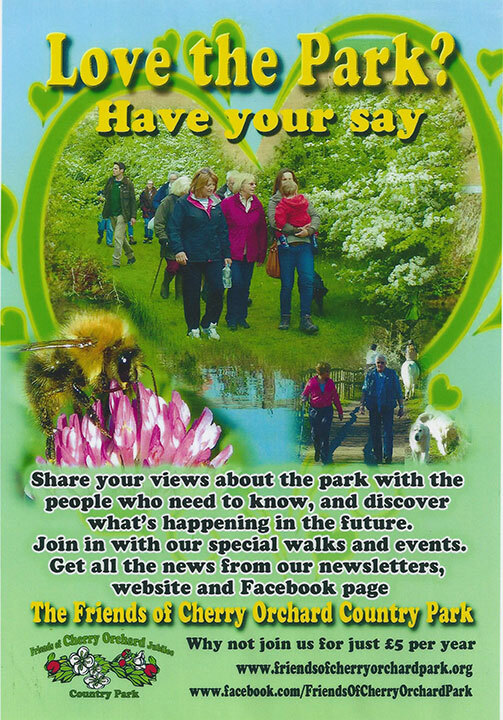 Members also have the opportunity to be included in consultation with Rochford District Council about the forward development of the park. Our group is in close contact with the Assistant Director for Environment at Rochford District Council and Cllr. Arthur Williams, RDC Portfolio Holder for the Environment. Be part of the growing Friends community. You can use your credit or debit card or use your PayPal account. Paypal manages all payments securely for Friends of Cherry Orchard Park. ​Our group is reaching more people now with over 600 visits a week to our website and more than 1200 page “likes” on our Facebook page. The Friends priorities continue to be the development and improvement of wildlife habitats and path improvement and maintenance. The Conservation Volunteer Group have been very busy in the park in the last year - read all about it in HERE and why not join them - all members welcome. Community Groups such as The Friends of Cherry Orchard Park are required for comply with the General Date Protection Regulations. Scroll to the bottom of the page to read our GDPR statement. Link to our full GDPR policy and procedures below. or download a membership leaflet below. Download two and share one with someone you know! If you prefer to pay by cheque download a membership form here. We will only collect, store and use data for purposes that are in our group’s legitimate interests. The Friends of Cherry Orchard Park hold your name, address and/or email address and include it on our mailing list in order to keep you informed about news, developments or problems in Cherry Orchard Jubilee Country Park or to invite you to be involved in events organised by our group, including Conservation Volunteers workdays. You may ask to be removed from the list at any time. Data will be stored securely. When it is stored electronically, it will be kept in password protected files. When it is stored online in a third-party website (e.g. Google Drive, iCloud) we will ensure the third party complies with the General Data Protection Requirements (GDPR) and needs two factor authentication. When it is stored on paper it will be filed carefully in a locked filing cabinet. Payment of your membership fee will be considered consent to your name, address and email address being securely stored. ​Download the full GDPR Policy ad Procedures HERE.